1. This "high five" belonged in last week's Friday post, but I had too much to celebrate last week and had to bump it to this week. Will, Hallie, and I thoroughly enjoyed the Ballet Brazos performance of The Nutcracker. We enjoyed watching the kids' friends dance, and loved the Rat King/Russian Dancer, who instead of ballet, danced a blend of ballet and a Memphis style of street dancing called "Jookin". (I suspect ballet purists might have objected to this break from tradition, but Will and I thought this stylistic change made the show more appealing to a wider audience. Will was actually falling asleep during the dance prior, but as soon as the Rat King began to perform, he jumped up and perched, completely entranced, on the edge of his seat until the fight scene came to an end.) Will and Hallie brought flowers for their friends Kaylee, Paloma, Kara, and Vivian, and afterwards, Will decided that he liked giving flowers to girls and that he might want to do it again, "just at random times" in the future. Oy vey. 2. Last weekend (on my birthday) we set up our Christmas tree and put out our Christmas decorations. Though I'd prefer to transition from Thanksgiving to Christmas after Thanksgiving, when Thanksgiving falls late in the month of November we unpack Christmas before we eat turkey. I love the way the house feels when it's been Christmas-ified, and I need at least four - preferably five - weeks of that feeling before the actual holiday arrives. 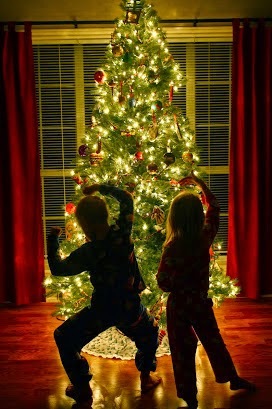 Tae kwon do and ballet in front of the tree. 3. Tom's parents, as well as Tom's sister and her new husband, came to visit us for Thanksgiving. Yes, we saw everyone just over a month ago at Jenna and Ferrell's wedding, but that doesn't make spending the holidays together any less special. I hope you and yours had a lovely Thanksgiving celebration. 4. For weeks, Will spent his spare time working on the "high part" of Heart and Soul piano duet. He finally mastered it at the beginning of November, and since then has been playing it on the regular with both Tom and me. After learning the high part, Will wanted to learn the low - and considerably more difficult, as it requires both hands, strong(er) fingers, and a five note reach - part of the same song. He kept at it though, and just a few days ago he decided he was ready to play with a partner. Hallie and Tux, zonked out in the beanbag chair. Tux, keeping an eye on Will while he sleeps. myself - a tree for Tom, a mitten for Will, and a stocking for Hallie. He thinks I can't see him behind that Ferris Wheel. when Tom's home. Looks super comfortable, doesn't it? herself when she grew bored at the Aggie soccer game last week. Hallie's singing a lullaby - Away in the Manger - to Tux. Happy Friday, and happy belated Thanksgiving!